Can a Country Get 90 Percent of Its Power From Renewables? Seder Boqer, Israel --- Renewable energy is often intermittent and unreliable, but with the right storage technology, it can become a substitute for baseline power. A paper that will soon come out from the National Solar Energy Center in Israel hypothesizes that the country -- which now only gets a tiny fraction of its power from solar -- could conceivably boost the total to 90 percent with things like vanadium redox flow batteries and pumped hydro storage, according to David Faiman, the director of the center and chair of the department of solar energy and environmental physics at Ben-Gurion University here. The paper is based on an hour-by-hour analysis of the country’s electricity consumption in 2006. Faiman’s group studied the baseline power, intermediate baseline and spinning reserves. Solar plants, without storage, could only generate around 3 percent to 4 percent of the country’s power without being forced to dump large amounts of solar power. “If you build a really large solar plant, you have a really large problem of getting it to the grid,” he said. If one were willing to dump up to 20 percent of the solar power generated because of transmission and distribution levels, the total could rise to 20 percent, he said. The 20 percent figure matches the estimates of other researchers in other parts of the world on how much renewables could become part of the energy mix. But add storage to allow a utility to deliver solar power generated during the morning and afternoon in the evening and, through the magic of storage, the figure zooms dramatically. 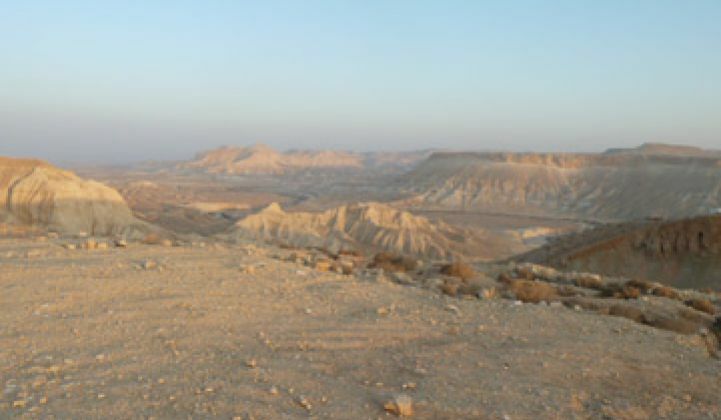 The country gets an inordinate amount of sun and areas like the Negev Desert in the south still sport quite a bit of open space. Plus, some of the intellectual property for concentrating PV comes from the region. The remaining 10 percent could be provided by gas-burning power plants: Most of the power would be needed at night. The country’s current goal is to get 10 percent of its power from renewables by 2020. Power costs around half a shekel, or 15 cents a kilowatt-hour, and feed-in tariffs have recently dipped below 2 shekels. So which storage technologies does he like? Pumped hydro is the first idea. Many regions of the country are relatively flat, but underground cisterns exist. Water could be pumped to the surface and then released into them. Gravity Power and Escovale Consultancy Services have touted similar subterranean ideas. He’s also a fan of vanadium redox batteries, which are large tanks with flowing electrolytes. Unlike sodium sulfur batteries, vanadium flow batteries don’t need to be heated to high temperatures. The batteries also resist corrosion, he said. Compressed air he's not so enthusiastic about in this scenario. Any storage technology in this scenario would have to be capable of delivering power rapidly. It takes around 15 minutes at a minimum to get a natural gas plant moving.